Gain potential visitors who come visit your website with these WordPress Social Media Plugins. Find out how plugins can give you creative social sharing options to increase social shares. Starting with traditional sidebar icons for sharing website fan page to the pop-up window and timed triggers on user exit intent, you will find them all. Get those viral features used by top bloggers to increase followers, likes and plus ones and more. Don’t back out from social media marketing as social sharing is the best SEO backlink you can get for your website. Google made it clear that social signals rank the website as it is one of the key ranking factors. Everyone should make use of atleast a few social bookmarking sites if they wish to run a business or even a personal blog. It is true that it gets irritating to manage social media profiles and analyze social shares, but here we have plugins which help you manage them like an expert. The plugins we introduced here can auto post your blog article to many social networks at once when you publish the content. This saves time and reduces our work. Like to have a color scheme to match your current WordPress theme ? The plugins here give you advanced control to change color, size, and shape of the social media icons. Social feeds will help you display content from your social media profiles and pages in a timeline style on your website. You can place them in the sidebar so people retweet, share them if they like. All social plugins come with responsive design so they fit well on mobile devices. Also, check the WordPress subscription form plugins to keep users hooked to your site once you have gained social fans. Social comments to reduce spam. Also take a look at more of our articles related to social media plugins. WordPress plugins in this section will help you increase your fan base by making your social networking sites much more visible. Widgets of these follow plugins will let you place the social icons in the sidebar or any widgetized area of your website with ease. Use shortcodes to call them anywhere you like. No idea on how to start ? This brilliant guide by Robert Kramers to optimize content and get social shares can help you a lot. We recommend you read it. One of the easiest to use and the best-optimized set of social share buttons with over 40 social networks. The design of the buttons is unique and you have the choice of its placement on the page and customizing them could never have been as easy. There are over 31 pre-designed templates for the icons which are just amazing. The social share icons are compatible with all the browsers and don’t slow your website. The page loading time is fast which also helps you improve your Google ranking. A well maintained and popular free social media sharing plugin with features to let others follow your social pages and sharing content on your pages/posts. The options panel for this plugin will let you tweak everything you might think of. 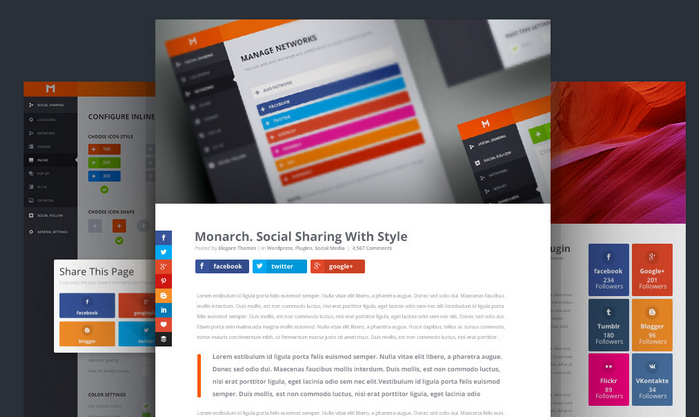 Supports widgets for sidebar and shortcode to add sharing icons to your posts or any position. Simplicity, powerful and high performance is what makes Social Media Feather different from the other social share plugins. Fast loading times keep your viewers focused on the content and share them. This non-obstructive nature of this plugin encourages the viewers to come back to your site for more and also bring in more visitors. The plugin helps your website to get an improved performance on the social platforms. Tumblr, LinkedIn, Email, Google+, Twitter, Facebook, and some more prominent social websites get powered by this plugin. 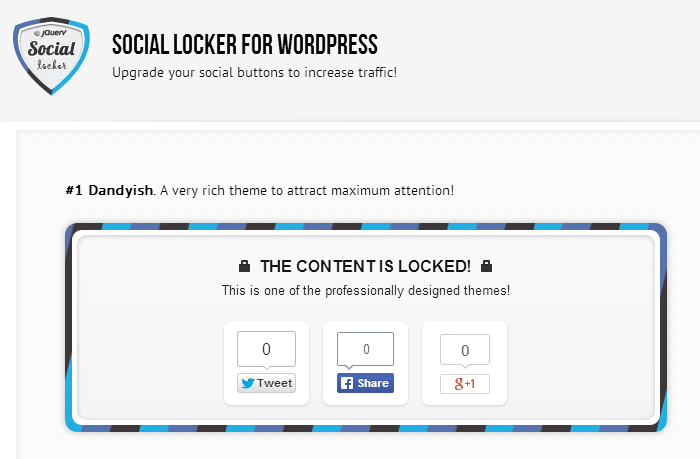 Social Locker is a unique social share plugin which locks all the exciting and important content which is accessible only if the viewer shares, likes or tweets your website page. You could also use these social media buttons to give users discounts of products. This also helps in improving the social presence of your website or blog. Your website attracts more quality traffic and besides getting shares and likes you get quality followers and customers. Using it is super easy, select the content you wish to lock and click the select button and you nailed it. Images, videos, audios, download links, and coupons or anything that you think the visitor gets attracted to can be locked. This is a premium plugin for WordPress that works on all websites. This plugin is compatible with Bootstrap 3.x and all the modern browsers. It is retina responsive and has a set of 30 social networks including Facebook, Twitter, LinkedIn, and Pinterest. The plugin displays the number of fans , followers, and subscribers that you have on the social sites. There are seven different ways in which the share counts gets displayed to your viewers. The options panel gives you setting you change it and also manage the css3 animations. Shortcodes and widgets are both supported letting you place the plugin anywhere you like. You can switch to lazy load option that delays the icon loading and as a result, improves the performance of your website. The sticky mode lets your widget stay fixed in the sidebar making your plugin visible at all times. Social Media Widget has a long list of social websites which it features. Besides the common ones it also has sites like Ebay, Steam, Meetup, Hulu, BandCamp, PlanCast, Live365 and much more. There are 6 more social websites icons which you can create if the required name is not in the list, using the URL. You can select from four different sizes (16×6 , 24×24 , 2×32 and 64×64) and 4 types of different sets of icons. There are different animations to add vigor in your social share buttons; you could scale them, fade them in, bounce the icons or have a combination of all the three. Arqam plugin lets your users see your latest count of followers and fans from your social websites. The augmented numbers also encourage more people to join and follow your page or website. All your follow counts are cached for optimized loading all over your website. There are five different designs of social share buttons that Arqam gives you to select from. You also have the option to select the number of columns and the color. Besides the plugin is also retina ready and 100% responsive. The developer offers lifetime free updates. You also get the po. and mo. files and is translation ready; set your choice of language and you are set to go. This wonderful plugin helps you convert your potential leads to customers. There are 44 social websites options for you in the Social Share & Locker Pro WordPress Plugin. You can select whether or not to display the social counts or network name, use a specific template and vertical position or horizontal. The social locker is an exciting feature which is a dynamic tool for social networking approach. Autolock or delay the time, share or like the page to open up content or to read more and make your website an exciting place for your visitors. There are many options for you to select the placement of display of these social buttons. Sharing your blog posts on many social media networks is essential to rank well in search engines these days. We introduced plugins which will automatically share posts to Facebook, Twitter, Linkedin, Tumblr when you create them, it’s that simple. Don’t just stop there either, you can use plugins like revive old posts that will tweet old contents. There are some free and paid features in this plugin. Every share icon is high-resolution vector font. There are many filters and actions making it developer friendly. It also features virtual share count which helps you to increase the count of the shares virtually thus attracting more shares from customers. There are many easy shortcodes which can be used for various customizations. The plugin is compatible with different Add-Ons. Easy drag and drop function to change the order of the display of share buttons. Has .po files which make it translation easy in any language. The color of the share counts can be changed from settings. This is an amazing plugin which lets you keep the old posts alive by sharing them and attracting more traffic from other social websites. You can pick the interval between two posts and select how many posts you wish to share. Hashtags have become popular and the crowd seems to love it. You can add hashtags to center on your topic. Certain posts and categories can be excluded if you want. Also, you could add links back to your website. The pro version of Revive Old Post plugin opens up more exciting features for you such as – multiple social accounts, custom schedule, post with an image, etc. 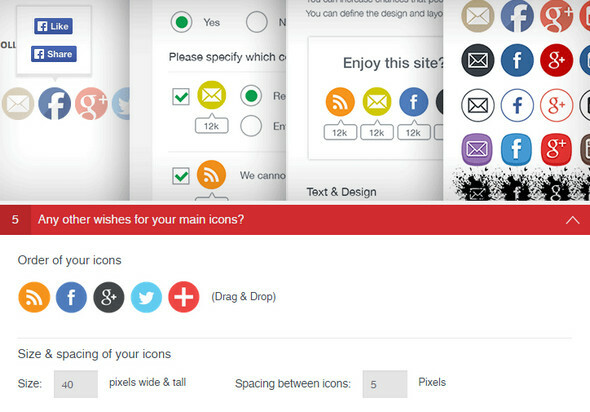 Totally free plugin with many themes to style, alter your social icons according to your site needs. Also has a subscribe feature to follow your website through popup. A must try plugin for those who like to have that extra control over the settings. 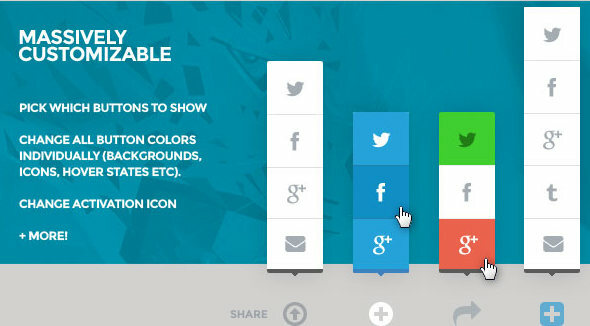 Social Media and Share Icons is free to download plugin that offers some exciting features. You have 16 designs of the social share button sets which you could pick from. You can choose which page you need your visitors to share. The plugin is simple to use and the set-up hardly takes a few minutes. There is step by step instructions mentioned using which anyone can set it up on the website. Besides being responsive design these cool icons are also browser friendly and tested on all modern browsers. On clicking the share button users are normally guided to the social website and diverted from your website. But with this plugin you can load two files, one is to add the icons and the other is the pop-up function to the sharing links. This way your user will not have to leave your website. You could select a different style if you want as you have the option to disable these options. There are various styles of icons that also have a hover effect. The plugin is translation ready and there are 10 common languages that it is available in. 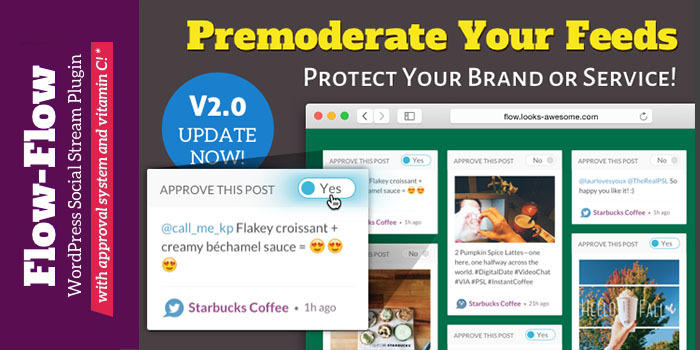 This plugin enables your visitors to share your products on social media platforms. This increases the popularity of your website and also increases the sales of your products. Instagram sharing is not available for this plugin as Instagram doesn’t permit social sharing like Pinterest and Facebook. The plugin is easy to use and you have the options of placing the share buttons. You have the option to select which products to share and which not to share. A free to use plugin, Social Share is simple to use and comes with many options to customize it. All the icons are optimized and responsive so you also improve your Google ranking if you use this plugin. The icons are beautiful and you have the option to place them anywhere on your website. Beautiful color combination of the icons is definitely an eye-catcher. 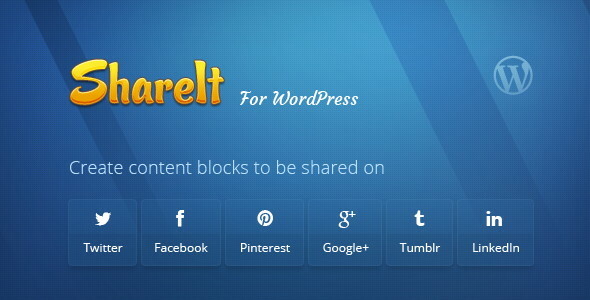 WordPress Article Social Share is a premium plugin which can be downloaded from our website. All the layouts of the plugin are responsive in design and the plugin is cross browser friendly too. You can be creative and build your own share bar using the customizing options and settings. It supports more than 15 famous social networking websites. The icons are elegant and use CSS3 design. 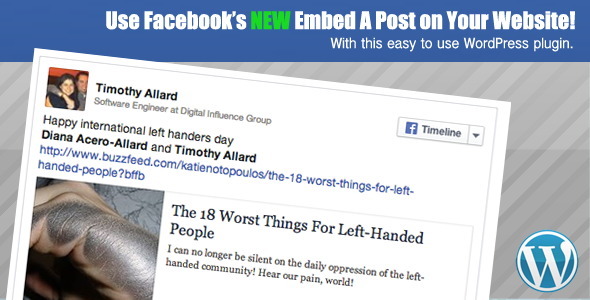 The social share bar can be selected to appear on certain pages. 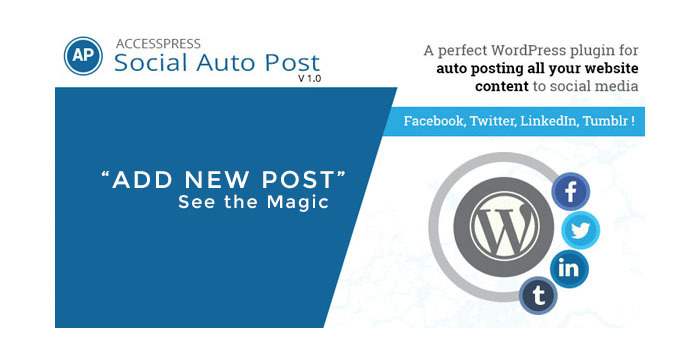 Social auto post is a free plugin made for auto posting to popular social networks. You can customize from the settings and decide which posts to have a share option. All the new posts are auto posted, if you don’t want this new auto post feature you can change it from the panel, you don’t have to go to the plugin settings. The plugin is lightweight and you will have the installation done in minutes. You can track all the auto posts to individual accounts with the logs. You also get email and forum customer help and free updates for the rest of your life. Click to Tweet plugin will integrate with the Tweet web app and let you add Click to Tweet boxes in all your posts. The design is simple and the plugin is super easy to install. It just takes a couple of seconds to do so. Your readers can now tweet your images, links, and content without any hassles. The WordPress network plugin to tweet text is a super plugin I have seen in only top sites like IGN. This is a premium plugin with the help of which images on your website gets a share feature on mouse hover. There is an option of 11 famous social websites that you can share your website images in. All the settings of the plugin are in one single page and there is no coding required, you could easily change any features you want to. There are 3 styles of icons that come available in this plugin. The plugin has been set to pick images greater than 200×200 pixels but you could change this size option. There is an exciting pop-up window for the user to engage in as it also increases your sharing. The icons have a beautiful design and the plugin is easy to install as there is no coding required. The website page loading is not disturbed if you use this plugin. There are free and paid features that come with this plugin. 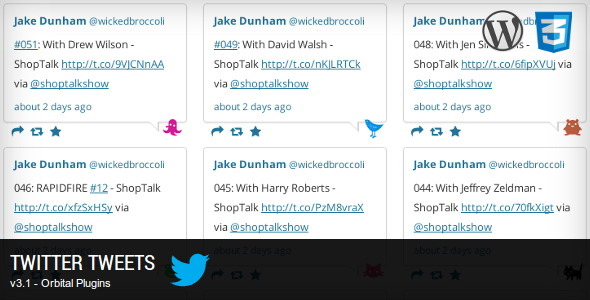 You can track your users sharing possibilities with the ‘Copy and Paste Share Tracking’. You will know how your content gets shared. There is also the ‘Google Analytics Integration’ and ‘GetSocial Dashboard & Analytics’ features that help you in tracing sharing details that come with the paid features. Don’t limit your user login with just an email and password. Allow users to connect to their website accounts via social media platforms that are very popular and secure. Most of the times users are already logged into the popular social websites this is where Super Socializer comes in and saves the time. A plugin which will help in increasing the share counts, sign up rate of your blog or website. Since the plugin allows sign up from social websites it helps to secure your website login by permitting people with social accounts. You are going to be free from the spammers even in comments. It features the ‘social commenting’ that lets the users comment on your blog with their accounts on social networks. This increases your credibility, your website gets viral and you also have real comments. The URL shortener services along with target URL customization make this a powerful free social media plugin. There are 16 popular social websites that come listed in social login plugin. Integrate it on your website with the step by step guide and documentation. There is a range of customizing options to make your social sharing buttons look attractive. There are easy shortcodes with which the icons can be displayed horizontally or vertically. You can see a preview of a specific selected social share button from the admin panel and change any settings. You also have the option to select the theme for social login and social sharing icons. 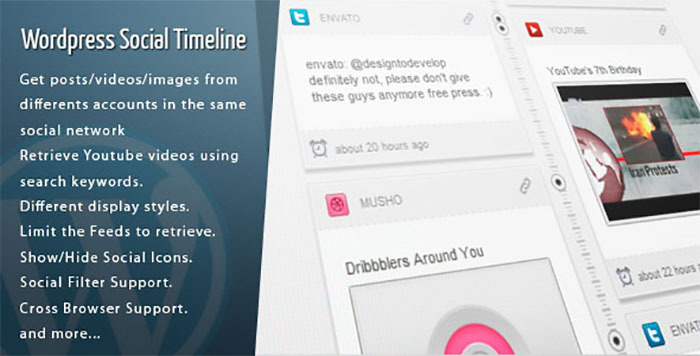 This Social Timeline plugin from DP Pereyra allows the user to retrieve posts, videos, images and status from various social websites in a format where the recent one is at the top. You could also retrieve YouTube videos using keywords and tweets from Twitter with the help of hashtags. It has been fully documented for its easy use. The plugin is also compatible with all the modern browsers that are used today. You can have your social networking websites displayed in the most beautiful grid style which is fully responsive. It also comprises of live search and detailed filters. You can select to display the combinations of your choice. For instance, you could have 3 Facebook pages, 2 Twitter hashtags and 3 Instagram users in a single stream. The combinations can be changed whenever you want and as you want. This is a paid plugin but it is wonderful if integrated into your website. Another paid plugin that is compatible across all browsers and supports many other plugins such as BuddyPress, WooCommerce, and Visual Composer. You can create beautiful galleries with different pictures from Instagram and much potential to define the required sources and to add on more filters. There are 10 color schemes and more than 60 adaptable parameters. The plugin is fully responsive and mobile friendly which is bound to attract many customers. You can also select which pictures you want to display in the grid. You can show only the best ones to your visitors. This is a great plugin for YouTube videos for your viewers. It lets the viewers create their own playlist from the channels of their choice. The plugin supports about 16 languages, 100 adjustable parameters, and 4 color schemes. It is a fully responsive plugin which is compatible with all modern browsers which will help in covering more audience for your website. The videos can be divided into groups or you could make a structured video playlist based on different parameters. Yottie gives you complete control over the content in your channel. 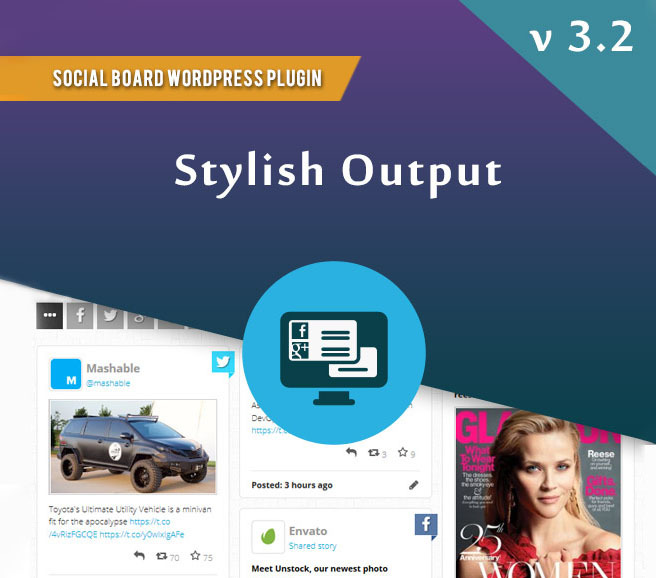 For those who wish to bring together their entire social networking activities in one place and put it on display then WordPress Social Board is the plugin which is perfect for the job. A mainstream can be made using the features of the plugin comprising of all your social network accounts with multiple profiles and present them in 6 types of different formats. 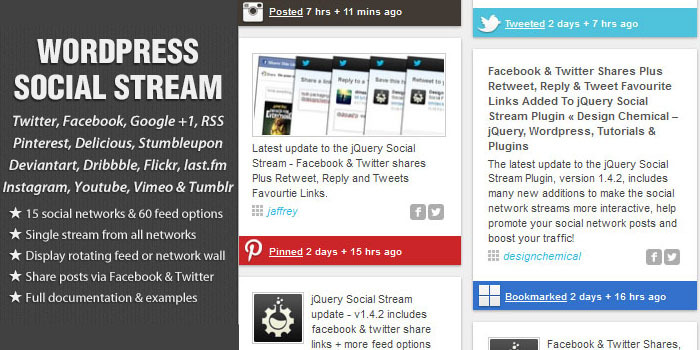 There are around 35 feed options and 17 popular social networks that this plugin supports. Visitors have the option to re-tweet, reply or add to favorite Twitter posts on your board. The style of the board can be changed from the theme manager and designed according to your own creative style. Facebook is undoubtedly one of the most popular social media platforms where thoughts and views are shared. So why not display a feed which is completely customizable and can be crawled by search engines too? Custom Facebook feed is your answer to a plugin which can help you display customizable Facebook feeds for public Facebook pages or Facebook groups on your website. This helps in increasing social engagement with your users and your Facebook’s content visibility also gets a boost. With new features being updated on the plugin regularly, it is a highly functional plugin which helps you display your Facebook content in a style that compliments your website. 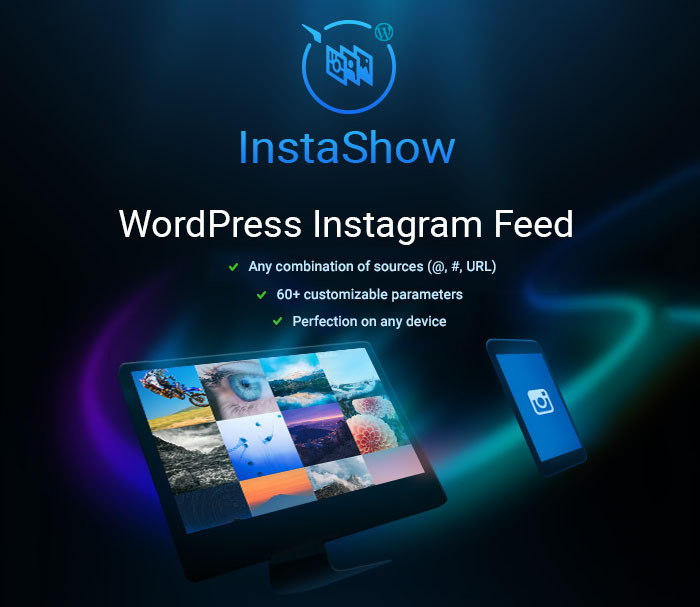 The Instagram feed plugin keeps your users abreast with Instagram feeds that you wish to display in a style that helps you maintain the fluidity of your website. With the help of built-in shortcodes, you could customize every aspect of the Instagram feeds. You have the option to display the feeds in full size, medium or as thumbnails. It also comprises of a button with which the users can follow the particular feed on the Instagram. You can have your feeds displayed either randomly or in a chronological way. There are no bounds to the number of feeds you wish to upload, just use the ‘Load More’ button and keep. 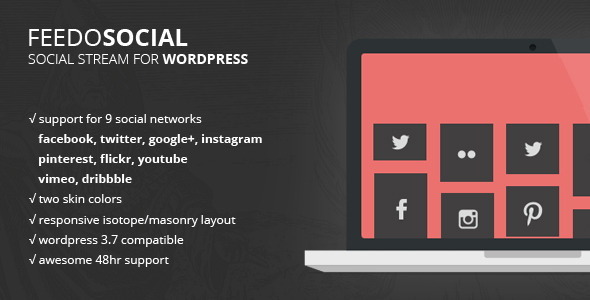 The ease of bringing all your social network feeds together to one single stream can be achieved with the help of the WordPress Social Stream plugin. Using this plugin, you can combine an unlimited number of social feeds and choose from 15 social networks and 60 feed options. Twitter, Google+, LinkedIn, Facebook share links are included in the plugin which will make your social networks active and will help to boost your traffic and make your posts popular. This is an amazing plugin which comprehends the URL which is entered within the shortcode and proceeds the custom embed. With this plugin, you can embed all types of Facebook comments, pages, albums, videos, profiles, pictures or posts to your website. The plugin also has a premium extension which features more options such as embedding personal data, shortcode creator, embedding full fan page shortcode and much more. This Instagram Photo & Video Gallery allows you to display the last pictures of any Instagram user or tag, has many options to configure and makes it ready to use for your sidebar. This is a fully responsive theme and features 5 different galleries. There are 5 endpoints – end gallery, liked gallery, location gallery, tag gallery and user gallery. You can present both videos and pictures. The plugin works with all types of device and has 7 skins which you can select from. You can set your own language. The plugin increases the load speed of the images as it uses a cache system. Every gallery can be set to refresh its cache time. YouTube, Facebook, Pinterest, Instagram, Dribble, Instagram, Flickr and Vimeo are the 8 social networking sites which can be streamed with Feedo. It has a cool masonry layout and comes in two skin colors. It has a fully responsive layout which means your website will look perfect in all types of devices. Feedo is a simple yet powerful plugin which can be installed in no time. 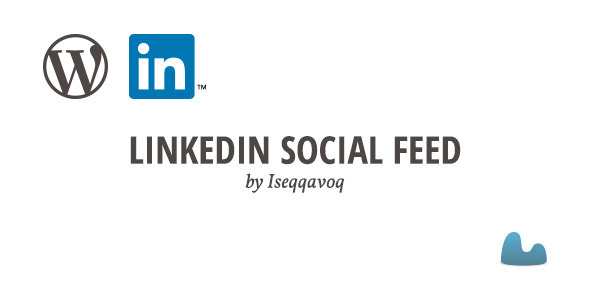 You can decide whether to put the latest posts or the best posts; LinkedIn Social Feed is a plugin which is going to give you some great options with LinkedIn. You can have the feed placed in a place of your choice on the website with a widget. You are at your liberty to use the number of widgets and every widget could be assigned to show a feed that your select. Updating feeds are easy, all you need to do is click the button opposite to every feed from the settings. You also have the option to select the number of posts that you want to be shown. A maximum of 20 LinkedIn posts can be selected to be displayed. This is a highly customizable plugin. With Twitter tweets plugin you can set your Twitter account widget id and username. The Twitter widget can be customized to expand the tweets pictures, increase in height, turn on or off the tweets reply, change the color of the custom link URL etc. You also have the choice of adding a follow button, retweet and select your special tweets, submit your tweet live on your website and so much more. This is a premium plugin which aids you in showcasing your tweets in a different way. 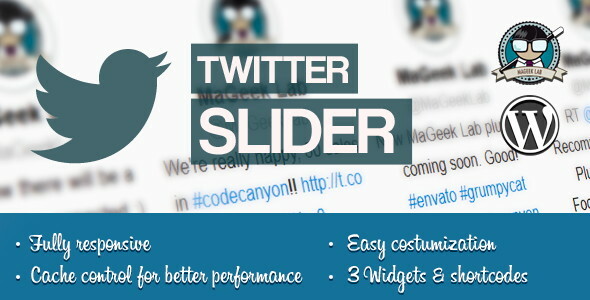 You could show the hashtag, search, and tweets of a user in a slider. Besides changing the slider to look horizontal or vertical there are many options to have it personalized in your own way and give it a unique look. You can regulate the speed of the display and transitions or controls that you want to have in the slider. Yoast is an exclusively helpful and wondrous plugin that helps you with many good features. Page Analysis helps you to check some of the things that you tend to forget. It reminds you whether or not you have images in your post or alt tag which comprises of the keyword for the particular post. If also sees if the posts are of the right length and if the meta description also consists of the main keyword. You will also be checked on any sub-headings used in the post. This plugin ensures that the content you have written is going to be searched by all the search engines. Besides driving more traffic to your website this plugin is mainly responsible for showing to your visitors the Facebook comments in your website. Facebook comments play a vital role in the social optimization which is why many websites use Facebook Comments box on their sites. You also have the option to disable the comments in a specific post or page if you want. This is a simple to use plugin which has a number of useful features. Facebook Messenger enables your customers to engage in a chat with you. You have an opportunity to help your customers get an instant solution, boost your product and services sales and also extend any help required by them. A notification is sent immediately to your phone and your computer when a customer sends you a message. 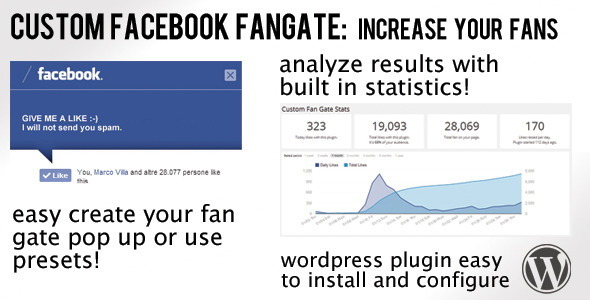 You also have the chance to increase your fan following with this plugin. An overlay pop-up is added over the posts and homepage of your WordPress blog which this plugin. The user is required to like a certain URL so the layer can be removed or click on the close button. This is also referred to as a ‘like gate’. This helps to increase the number of fans and build your popularity across this social network. You can make the pop up look unique and beautiful according to your creativity and imagination. You can also use a shortcode in certain pages so the fan gate opens only for certain pages. The plugin is very simple and easy to use as it has been designed ready with presets and you go live instantly. The plugin has been specially designed to improve your social and web ranking. It increases social engagement, click-through rates on popular websites and Google search ranking. There is a special support that is extended by this plugin which is that it evades all clashes between Facebook Open Graph and Pinterest meta tags. Besides it also adds open graph meta tags for popular social networks, Pinterest Rich Pin meta tags, and schema/rich snippet mark up/ structured data and much more. This is a wonderful plugin which is specifically made for customer delight. This plugin helps you to reward your customers when they like or share your page. You can give a discount to a customer who is then going to buy from you and in turn help you increase your sales. All the updates for this plugin can be availed for free. The plugin is also cross browser friendly and can run flawlessly on all the modern browsers. The best known and most used email subscribes are listed with SumoMe – MailChimp, GetResponse, HubSpot, Emma, Campaign Monitor, Constant Contact, AWeber and Vertical Response. You can attract free traffic to your website. It also features the content analytics using which you can know whether the people are reading your content or not. It has many useful features which are going to help you in handling the daily activities of your website in an easy way besides building up more customers for you everyday. There are 4 themes and 3 link styles features in the Social Sidebar plugin. There are 129 icons that you can select from to display your choice of social networking sites. The position of the sidebar can be selected between left or right. There are custom colors and CSS options with an automatic site integration feature. 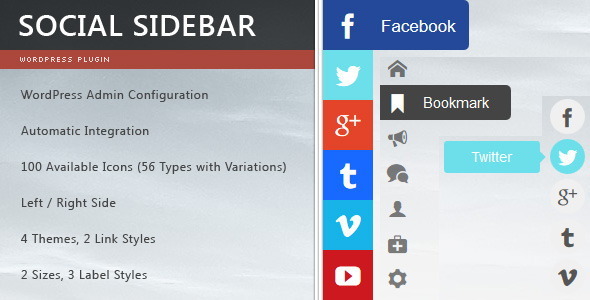 Social Sidebar is easy to install and use plugin. 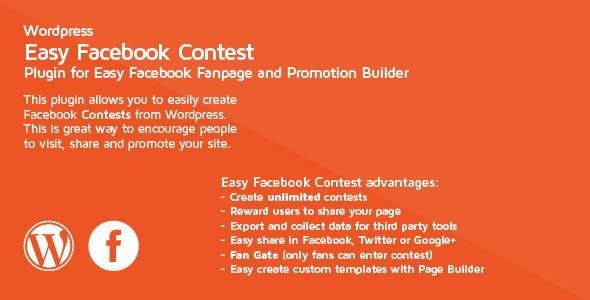 You could hold any number of contests on Facebook with the help of this plugin. It is a premium plugin. You also have the option to reward your users if they share your page. The Page Builder can be used to create some beautiful designs for the contests so you attract more contestants and viewers for the contest held. You also have the option of ‘fan gate’ so only users who have liked your page can enter the contest. This helps in increasing the fan count and your popularity. You now have the option to create Facebook Fan Page Tabs that can be linked to your WordPress website. Whatever you create on WordPress can be done on Facebook too. You can sell your products with WooCommerce display. Other features include share gate, fan gate and Facebook giveaways and sweepstakes. 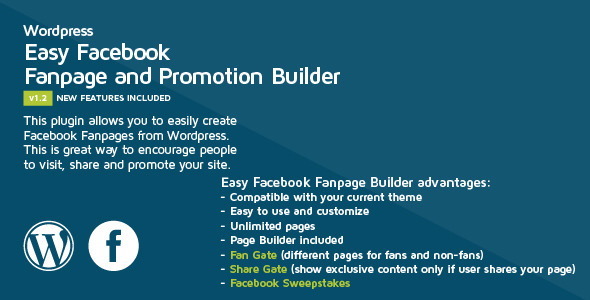 Promoting your website with Easy Facebook Fanpage and Promotion Builder is going to be fun and easy too. Snippets made of links, images and texts from the social networks like Pinterest, Facebook, Google + and Twitter, LinkedIn and Tumblr can now be shared with ShareIt plugin. ShareIt has been developed to understand every social network. For instance, for Tumblr, it takes the text and its source, in Pinterest it shares the image, description, and the link, for LinkedIn it takes the text, title and URL and so on. It is fully responsive and works on all devices. This is a cool plugin which uses a WordPress tool to add hovering effects on the social media share icons on your website. 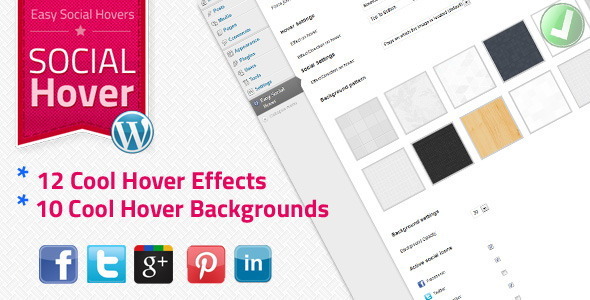 There are 12 different styles of hover and 10 hover backgrounds. You could also combine effects of different hover effects. There are 5 popular social media which are covered – Twitter, Facebook, Google+, Pinterest and LinkedIn. This plugin has been designed to redirect all external links in your posts through an exit page. You can place links, social bookmarking icons, and advertisements in this exit page. You can have an outgoing link, have it appear after a timer, etc. Having links of external websites will give away some SEO points to the pages that you have linked. This plugin will shield you from this ‘nofollow’ links. You can get an extra stream for social interaction if you have social bookmarking links in the exit page of your website. This plugin helps you increase your PPV, CPV, increase your advertising space, lessen your bounce rate and increase your social bookmarking by prompting your users to share before they can leave the site. Content marketing is the key to build a successful online business. While social media marketing might help many to reach their expected audience fast it still requires writing excellent article roundups which people love to share. You may want to look for WordPress plugins that can auto post to multiple social networks when the content is published as this will save much time. Hey guys, Would love your to try EmbedSocial,a platform that offers WordPress plugin for displaying social media galleries on a website.